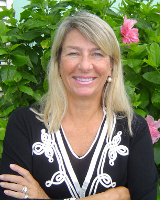 Sally Weld Lurie has been a perennial top producer in Vero Beach, Florida for 10 years. Sally is originally from Boston and Nantucket, Massachusetts. She and her husband moved to Vero in 2003. She acquired her Florida license in 2005 and maintains an active real estate license in Massachusetts. Accredited with a luxury home specialist designation (ALHS), Sally is able to assist customers with a strong knowledge of the local market and keep up with global trends. Listening to clients’ criteria, following through on the details of a transaction, and creating long term relationships are her goals. Sally graduated from Skidmore College in 1978 with a BA in English Literature and Art History. Prior to moving to Vero, she owned and operated a vintage wedding dress business in Newton Centre, Ma. for 15 years. When time permits, Sally tries to be a golfer, is an avid tennis player, enjoys antiquing and remains active in local charities.